Michael Stewart was an African American graffiti artist arrested in 1983 by the New York City police for spray-painting graffiti in a subway station. Less than 40 minutes later he was transported to Bellevue Hospital handcuffed and comatose and would never regain consciousness. A medical examiner reported that Stewart died of “physical injury to the spinal cord in the upper neck.” During the State Supreme Court trial some witnesses testified that Stewart was struck and kicked by officers while other witnesses said they did not see officers beat Stewart. But none were able to identify which officers took which actions at the arrest. In February 1984, a second grand jury was convened and three police officers were indicted. Three other officers were charged with perjury. On November 24, 1985, the six officers were acquitted by an all-white jury. 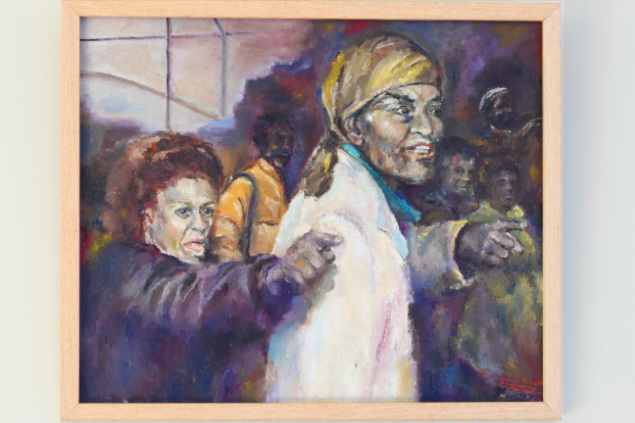 The painting shows a scene from the court room after the police officers were acquitted that day.